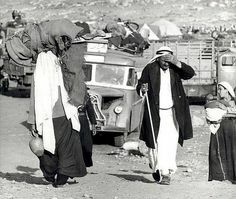 "In 1948 eighty-five percent of Palestinians in the part of Palestine that became Israel were displaced, 675 towns and villages were depopulated while their lands and properties were confiscated. 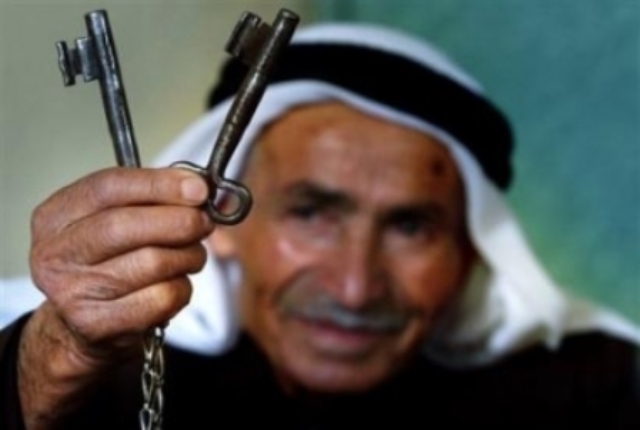 Palestinians refer to this experience as their Nakba"
An archival collection that contains more than 1,000 hours of testimonies with first generation Palestinians and other Palestinian communities in Lebanon. 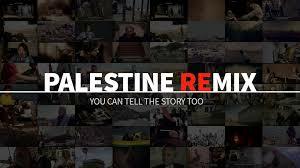 Documentary series on Al-Nakba from Al-Jazeera English: Episode1; Episode 2; Episode 3; and Episode 4. For additional documentaries or videos click here. Hammond, Jeremy R. "The Myth of the UN Creation of Israel." Foreign Policy Journal (2010). "If I were to sum up the  Basle Conference in one word - it would be this: at Basle I founded the Jewish State ..."
1887: Palestine divided by Ottomans into the districts (sanjaks) of Jerusalem, Nablus, and Acre. 1896: Publication of Der Jundenstat (The Jewish State) by Theodore Herzl. 1897: First Zionist Congress in Basel, Switzerland. Basel Declaration: calls for the establishment of a home for Jewish in Palestine. 1901: Establishment of Jewish National Fund. 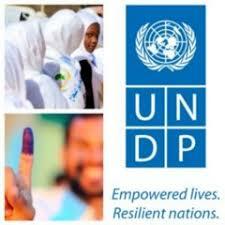 Main idea behind it is to fundraising in the purpose of purchasing land. 1914: First World War starts. 1916: Great Arab Revolt. The revolt was against the Ottoman rule and was initiated by Sharif Hussein in June 1916. 1918: Battle of Meggido: Palestine occupied by allied forces under British General Allenby. 1919: First Palestinian National Congress in Jerusalem send memoranda to Paris Peace Conference rejecting Balfour Declaration and demanding independence. 1920: Founding of Histadrust, a trade union which would organize the economic activities of Jewish workers. 1921: Founding of Haganah, the Zionist's illegal underground military organization. Churchill White Papers or British White Papers main purpose was to exclude Trans-Jordan from scopes of Balfour Declaration. The Council of the League of Nations approves the British Mandate for Palestine. First British Census of Palestine counted 757,182 residents, of whom 83,794 were Jewish. 1933: Adolph Hitler assumes power over Germany. 1936: Beginning of Arab Revolt calling for an end to Jewish immigration and a stop to Jewish ownership of land in Palestine. 1937: Arab Higher Committee rejects the Royal Commission proposal known as Peel Commission. 1938: Palestine Partition Commission (Woodhead Commission) report declares impracticability of Royal Commission's partition proposal. 1939: World War Two starts. 1942: Biltmore Conference. It recommended an end to British Mandate and called for the founding of Jewish Commonwealth. Arab League founded in Cairo. End of World War Two. Bombing of the King David Hotel in Jerusalem. It was organized by Irgun a Jewish militia. 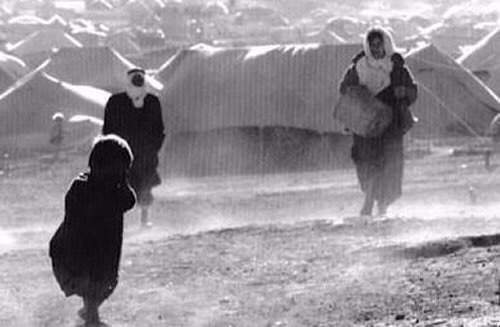 Anglo-American Committee recommended admitting 100,000 Jewish refugees into Palestine. UN General Assembly establishes a Special Committee on Palestine - UNSCOP. 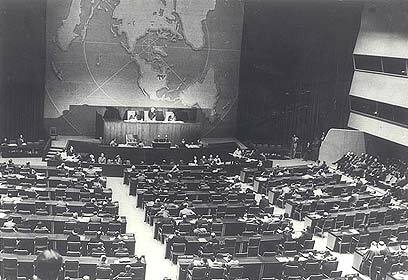 UN General Assembly votes to partition Palestine by October 1948, resolution 181. UN Proposes the division of Palestine into separate Arab and Jewish states allocating 56.6% of Palestine to Jewish state and 43% to Arab state with international enclave around Jerusalem. Haganah lunches Plan Dalet (March 10). British House of Commons votes to end mandate on May 15. US proposed the suspension of Partition Plan. General Zionist Council decides to establish Jewish independent state in Palestine. End of the British Mandate for Palestine. Declaration of the establishment of the State of Israel. May 1948. Abd al-Qadir al-Husseini forms Jaysh al-Jihad al-Mudaddas (Army of the Sacred Jihad). Arab Liberation Army (Jaysh al Inqadh al-Arabi) under the command of Fawzi a-Qawuji entered Palestine. Armies of Egypt, Iraq, Lebanon, Transjordan and Syria participated in the war. Bernadotte Plan proposes new partition of Palestine. Plan was rejected by both Arab League and Israel. UN General Assembly establishes Palestine Conciliation Commission. David Ben-Gurion becomes the first Israeli prime minister. Arab Israeli War of 1948 or Israeli War of Independence ends. Admission of Israel to membership in the United Nations, resolution 273. A photographic history of the Palestinians,1876-1948. Chronology 1919-1936 ; Chronology 1936-1939; Chronology 1940-1947; and Chronology 1947-1948.
from a UN report prepared in October 1948 for Ralphe Bunche. The timeline is compiled from reports of the US Department of State, the British Foreign Office and various American and British press services. A project of the Palestinian Museum. from the Institute for Middle East Understanding. A Palestinian History, Chronology from earliest time to 1949.